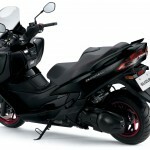 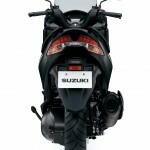 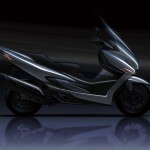 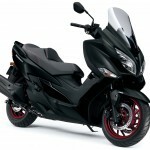 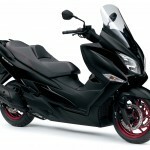 The original Suzuki Burgman 400 was introduced in 1998 and the last major update came in 2006. 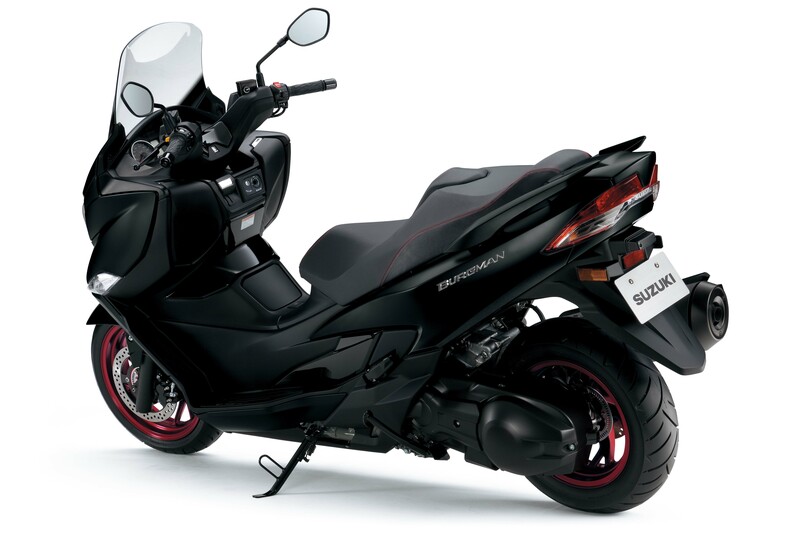 With new Euro 4 regulations kicking in next year, Suzuki decided it was time to give the Burgman a full refresh with a slimmer, sportier look. 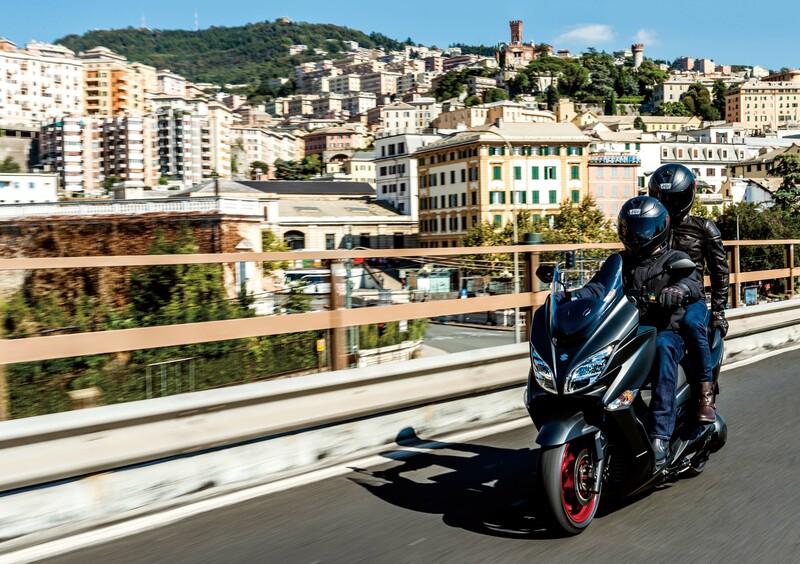 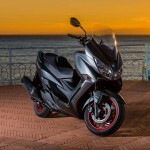 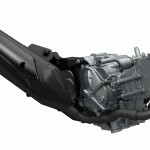 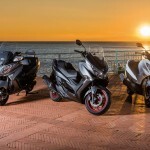 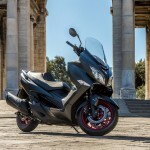 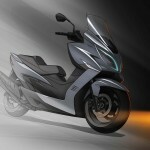 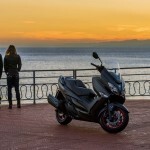 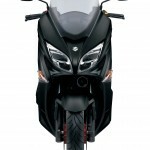 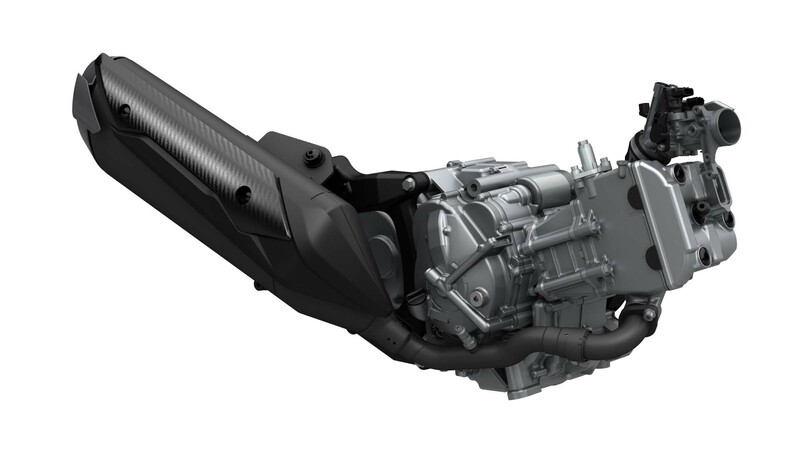 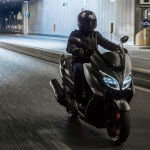 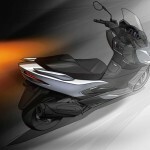 Suzuki updated the 399cc Single to deliver more low-to-midrange torque. 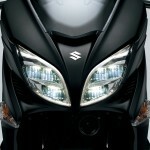 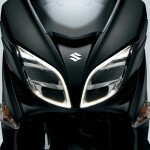 No figures were released but Suzuki says the engine offers better power performance even when riding two-up. 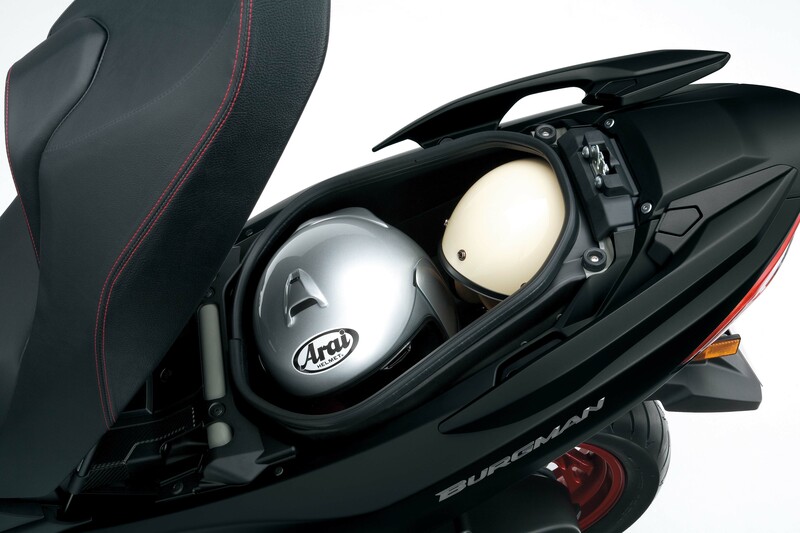 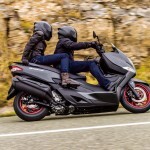 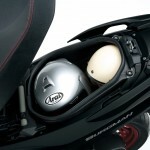 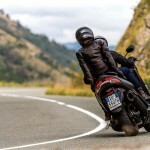 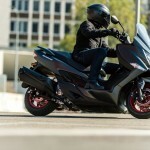 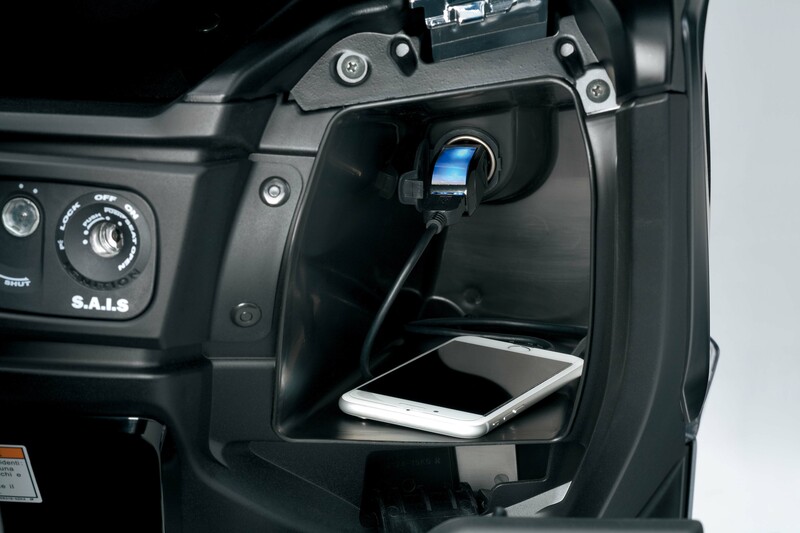 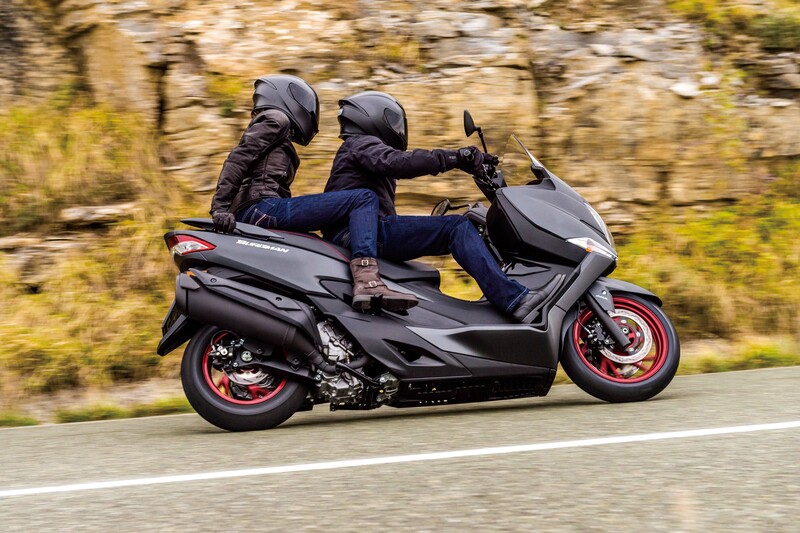 A larger airbox mounted under the seat was designed to improve throttle response and better acceleration in stop-and-go traffic while a iridium spark plug promises improved fuel economy and range. 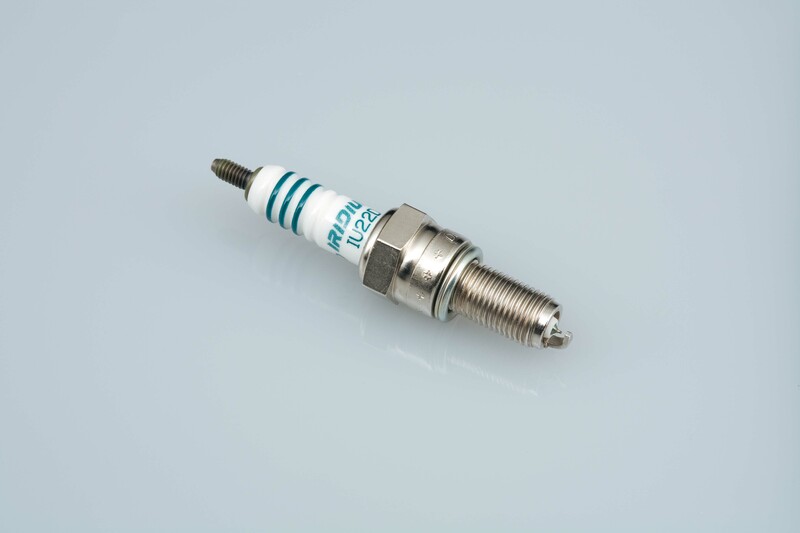 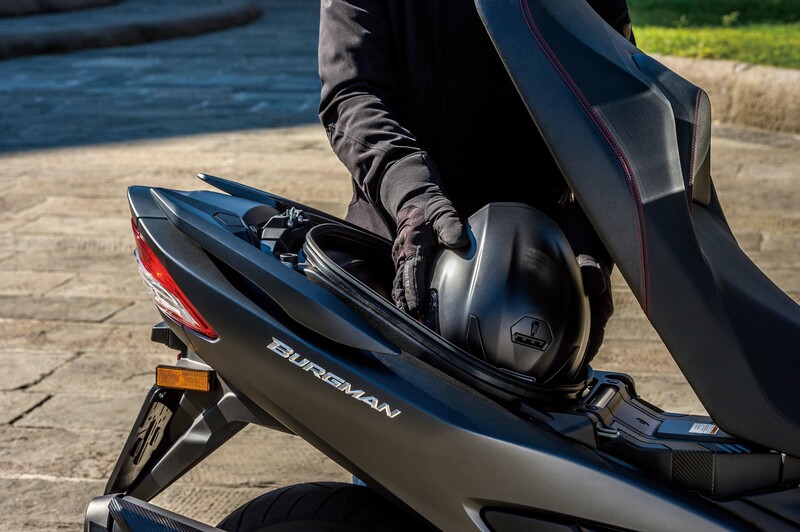 The new spark plug along with revised fuel injection system and a redesigned catalyzer help the Burgman meet Euro 4 emission standards without sacrificing performance. 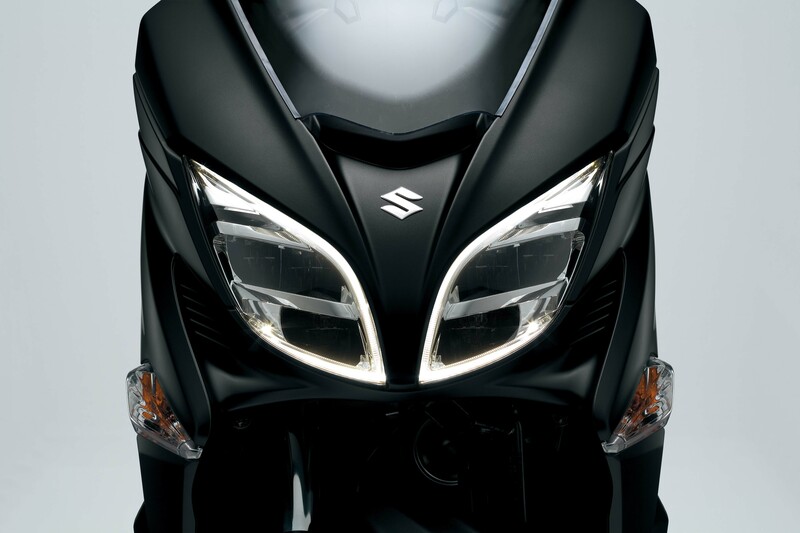 Suzuki describes the new look as coupé-like, slimming down the front and rear and making it easier to slip through narrow spaces. 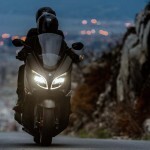 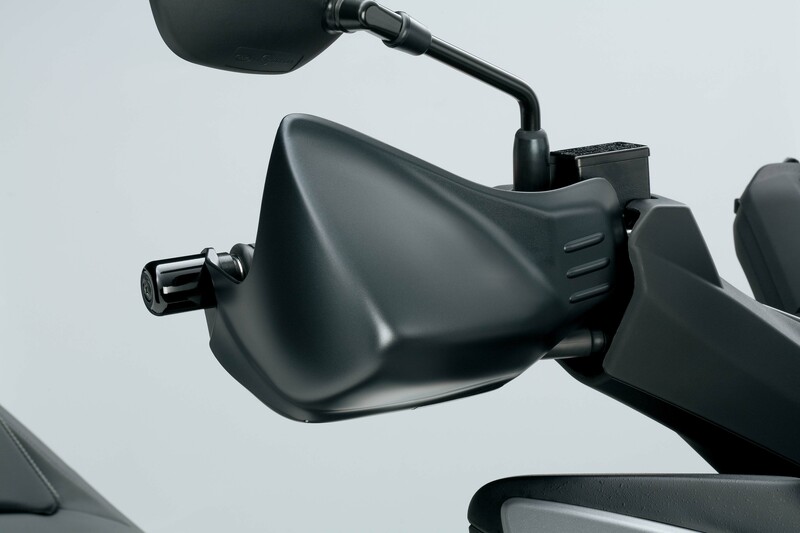 The dual LED headlights are smaller and look a little like the V-Strom’s lights. 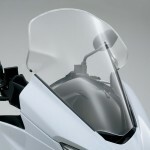 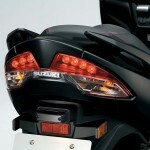 LED turn signals built into the fairing add to the cleaner, slimmer look. 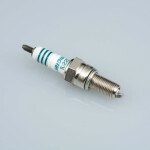 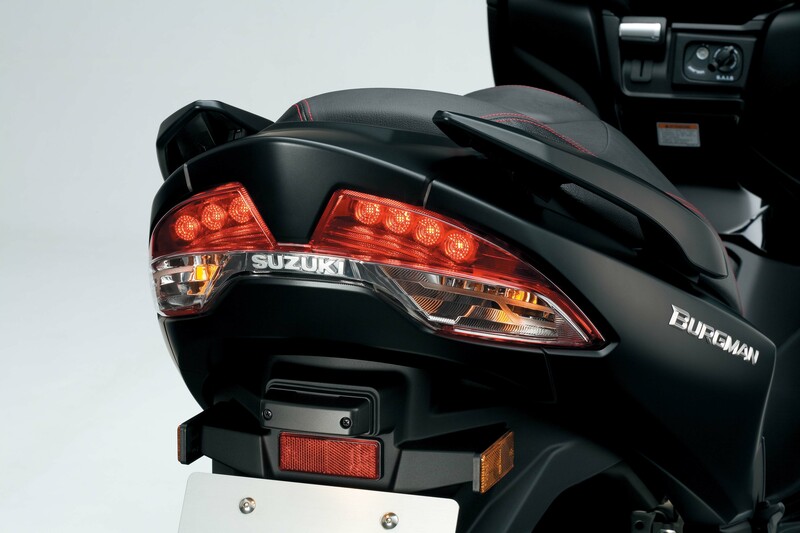 The LED rear lighting is also compact, with the turn signals integrated below the taillight. 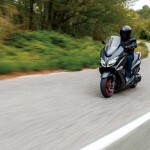 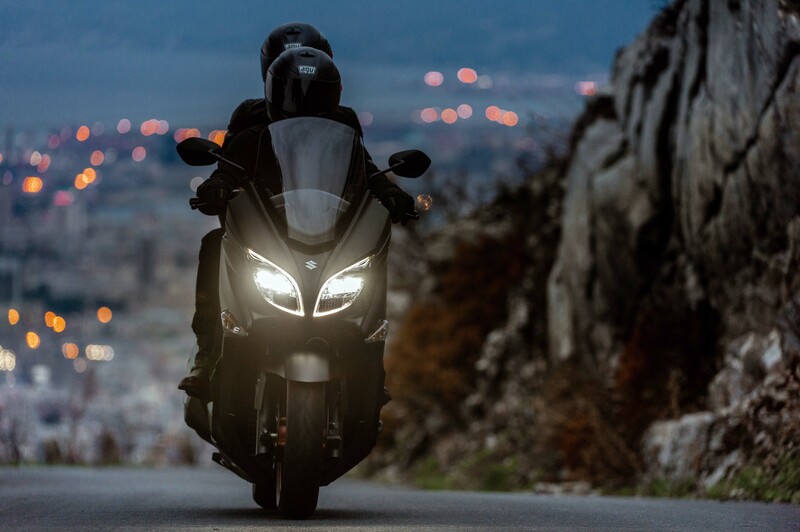 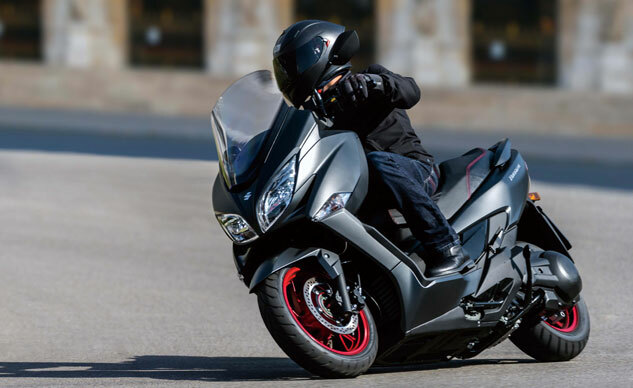 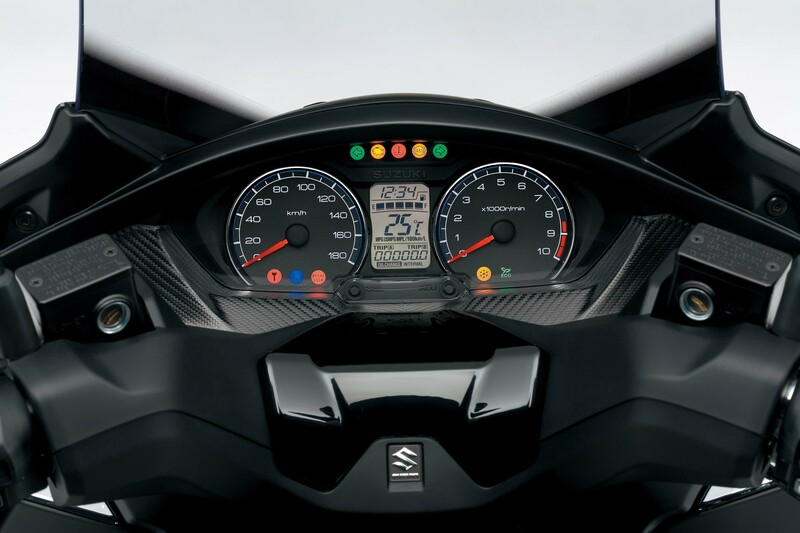 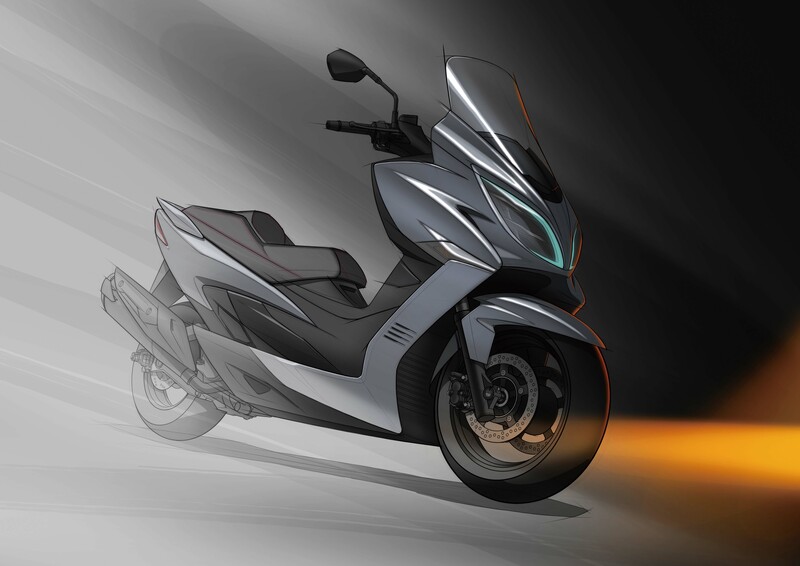 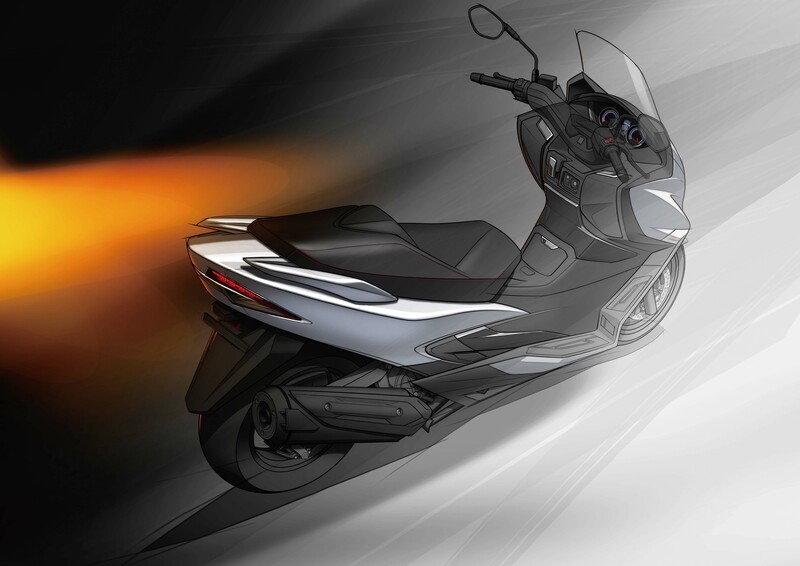 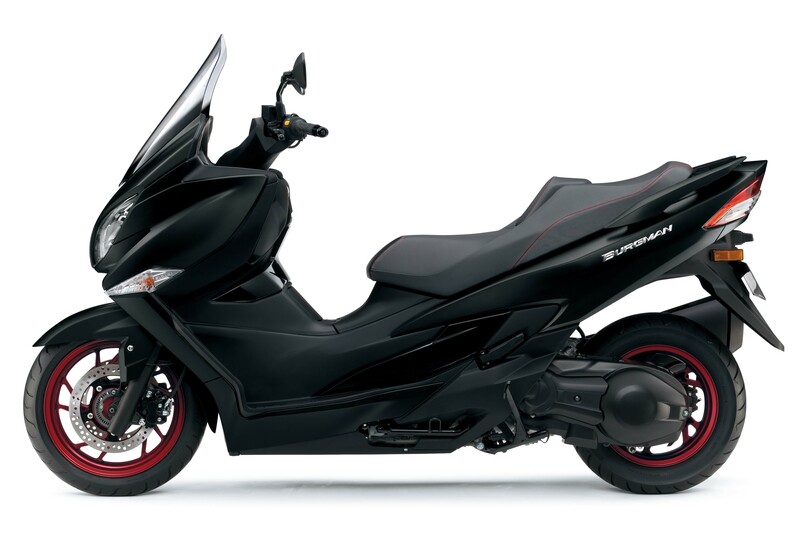 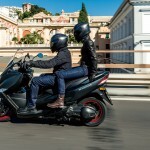 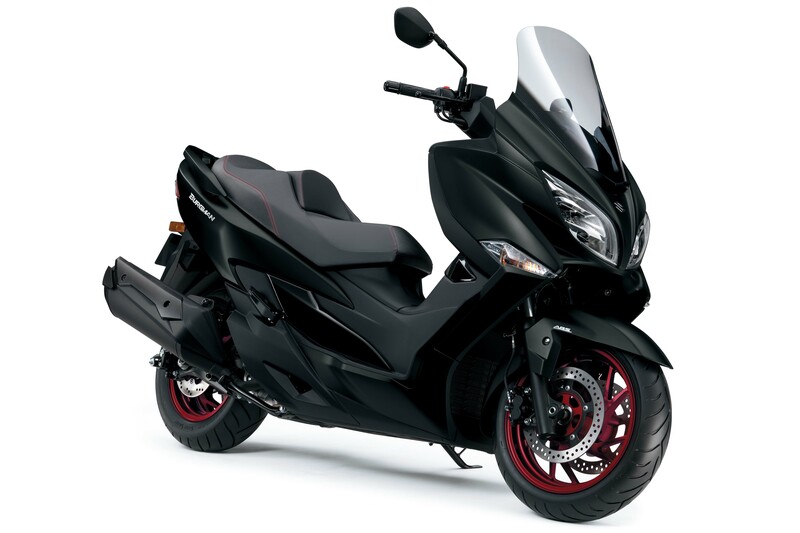 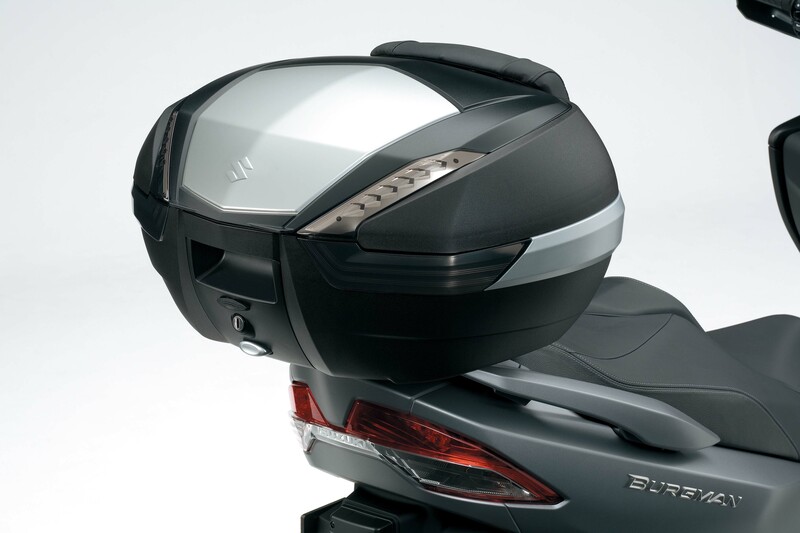 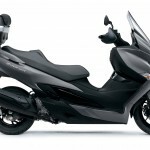 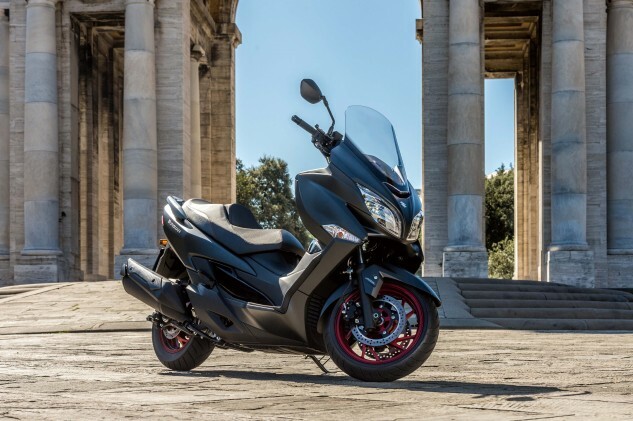 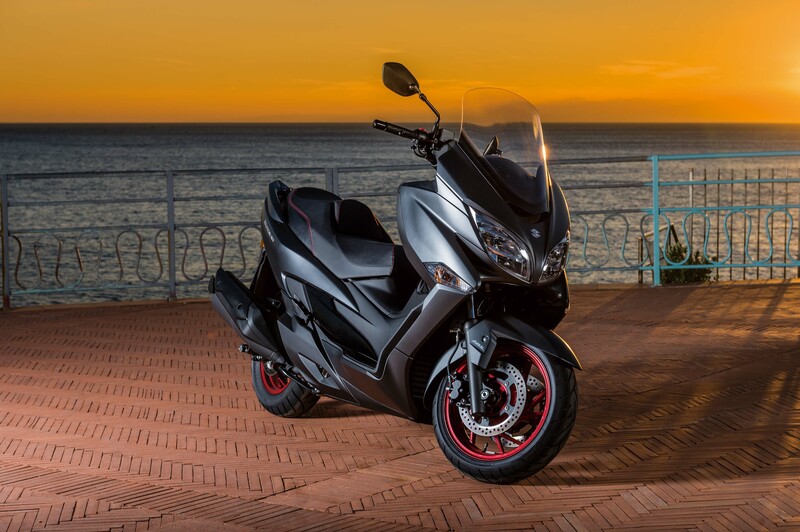 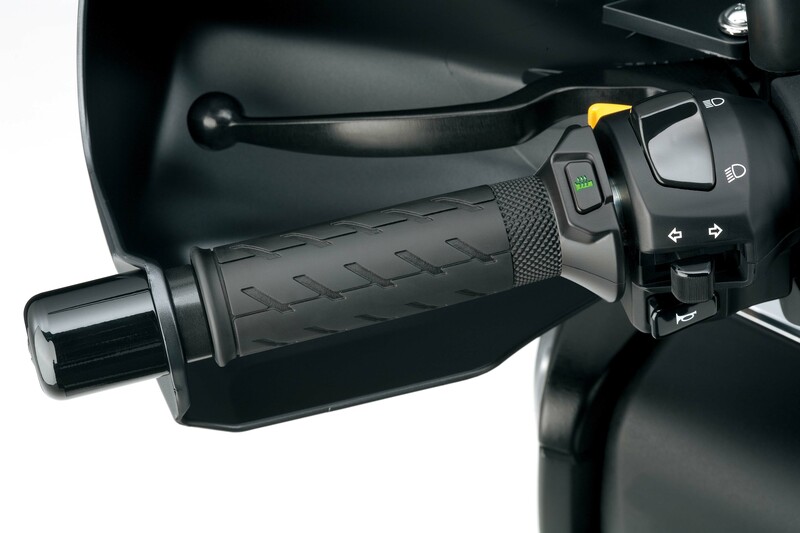 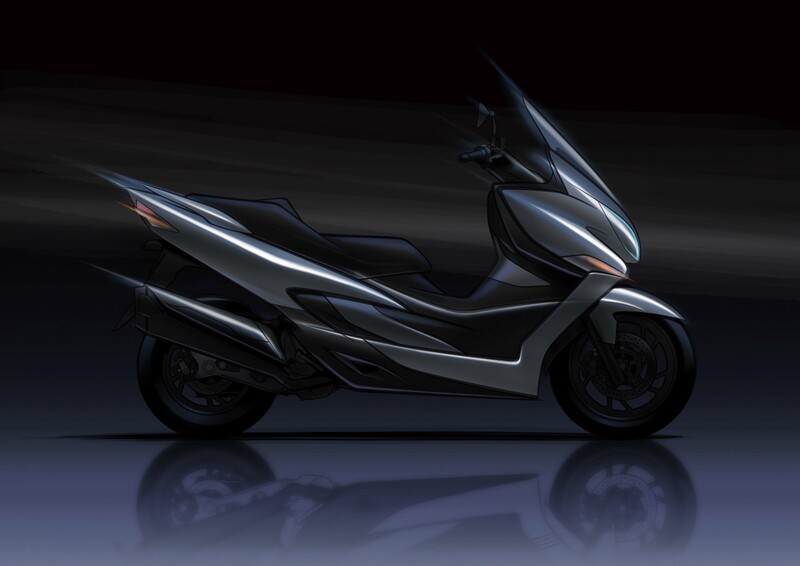 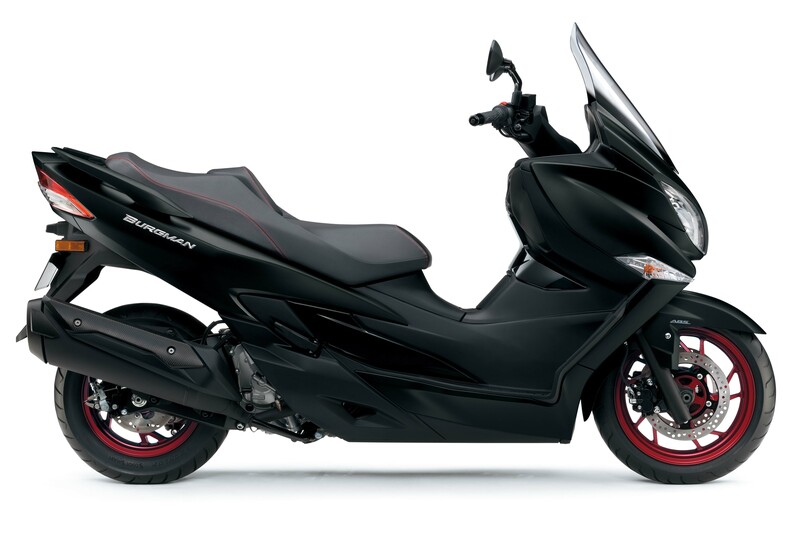 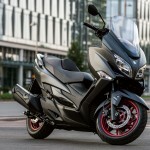 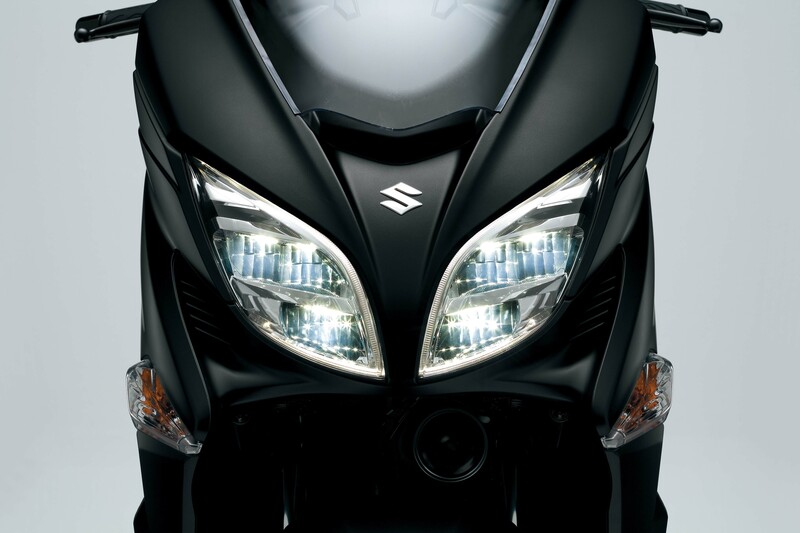 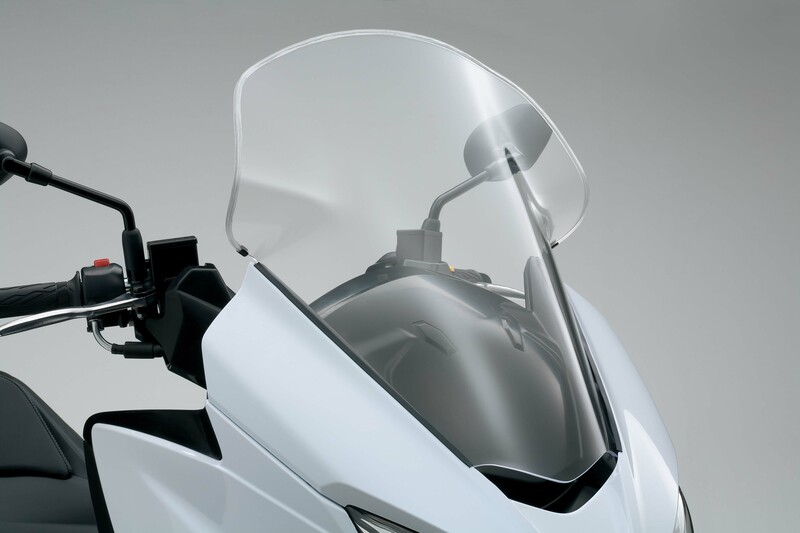 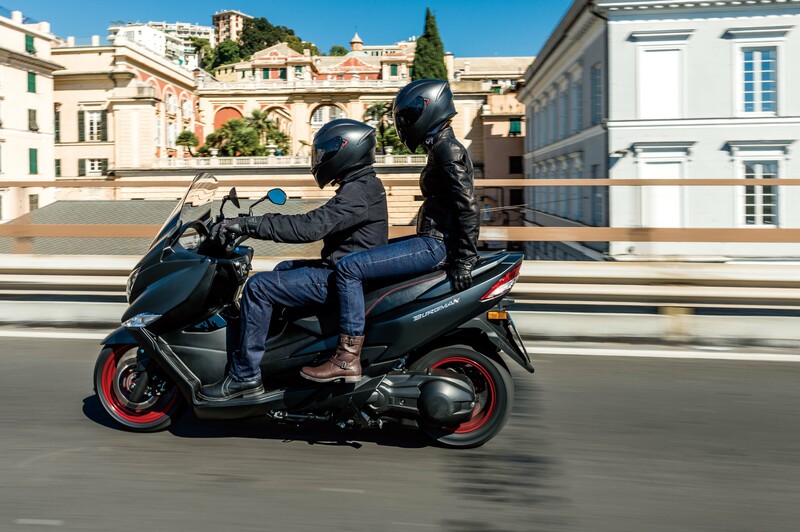 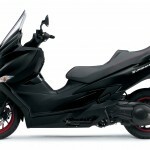 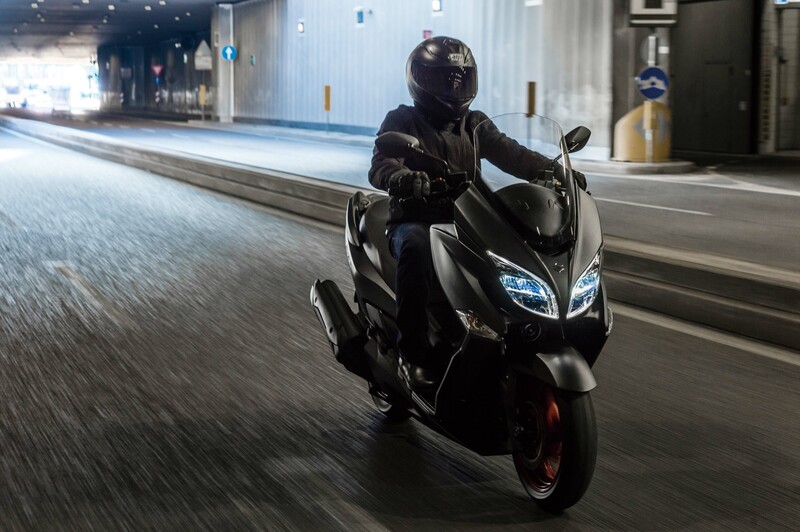 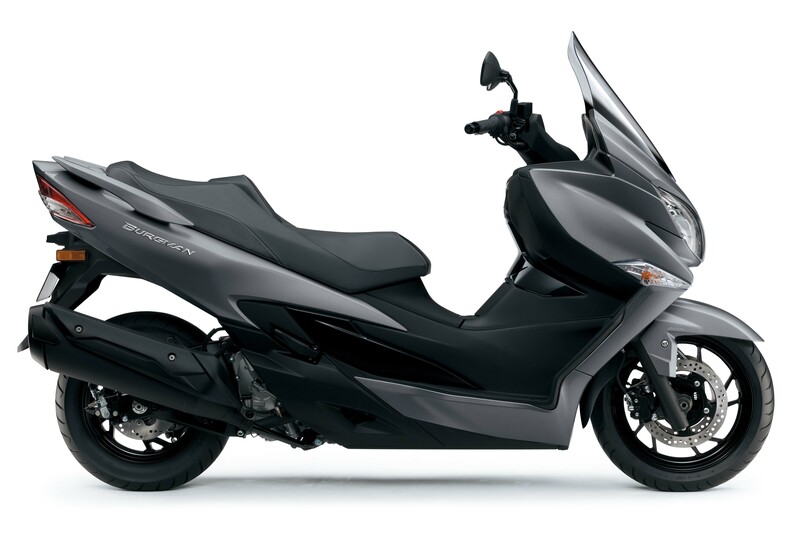 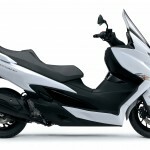 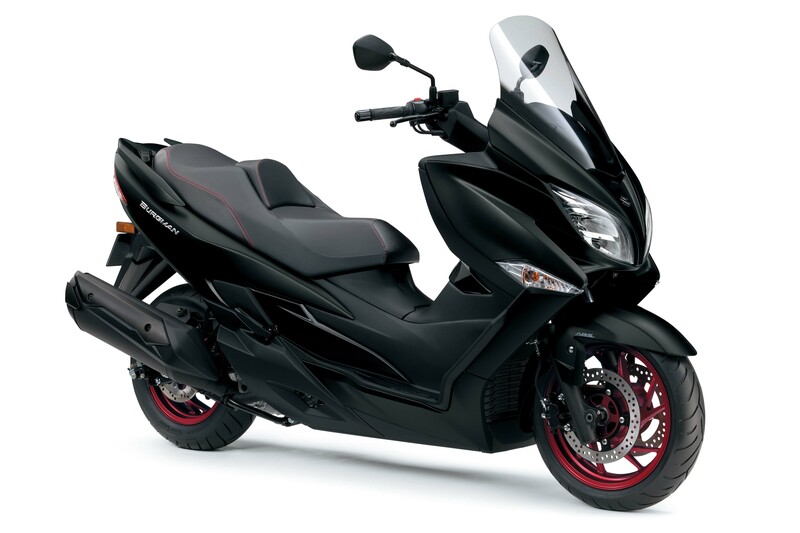 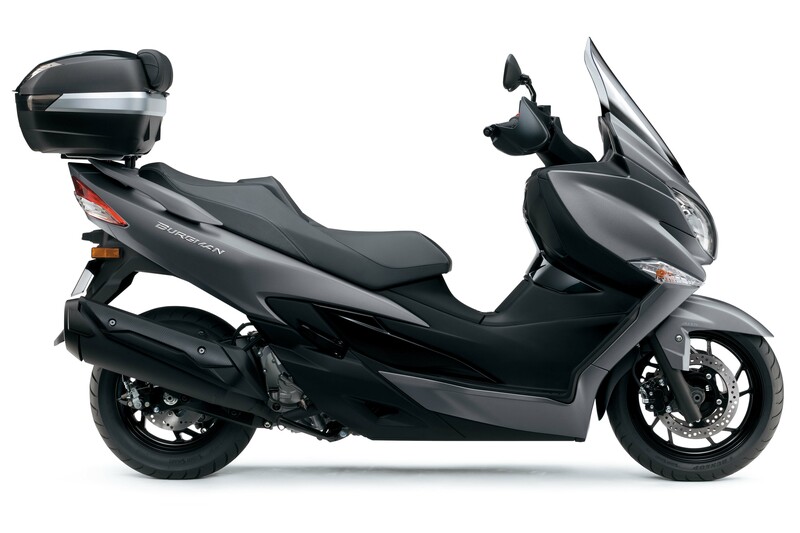 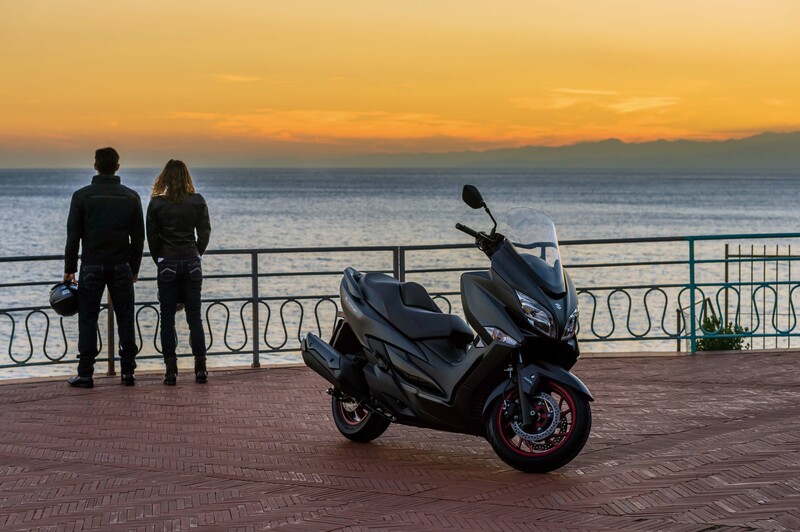 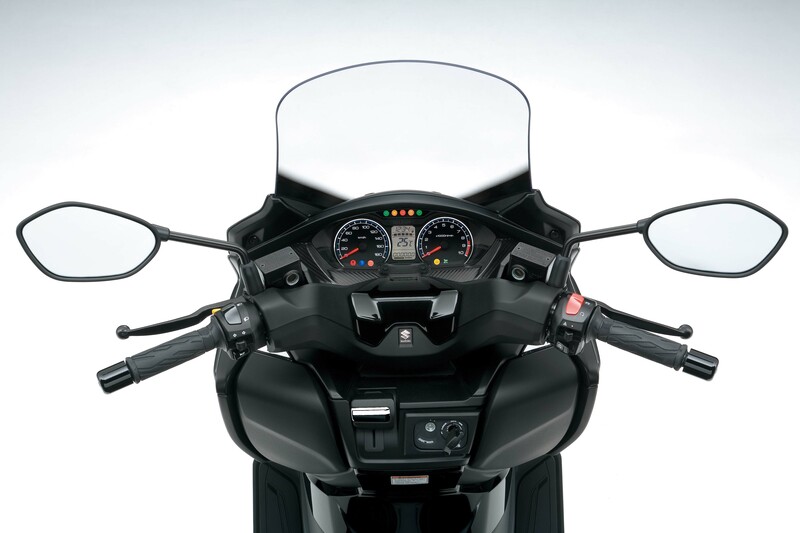 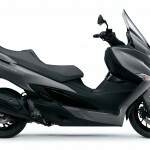 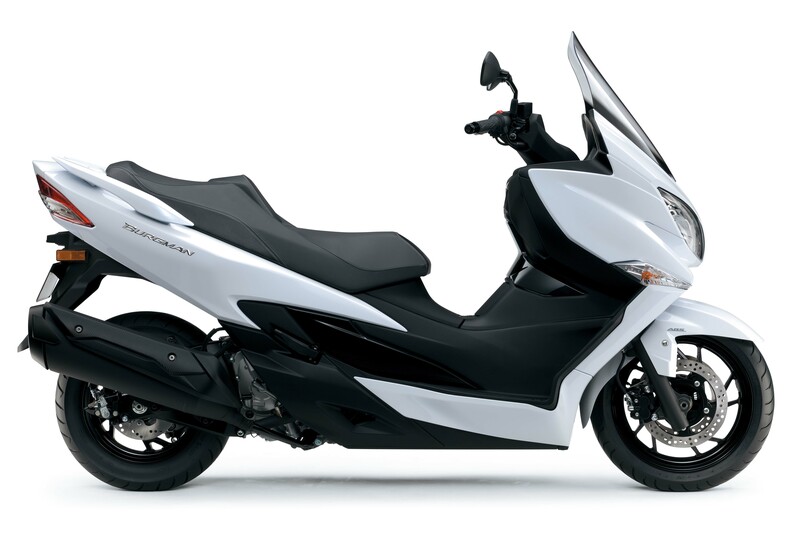 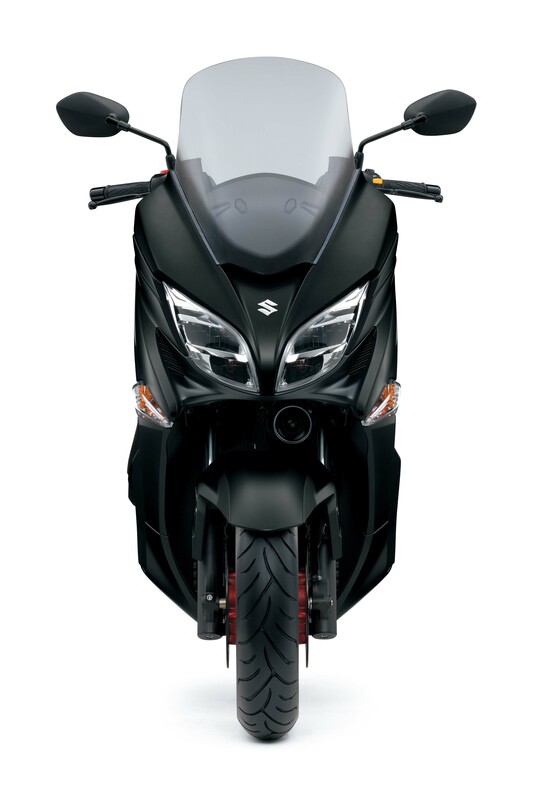 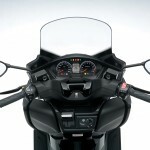 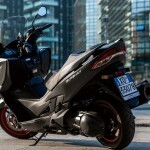 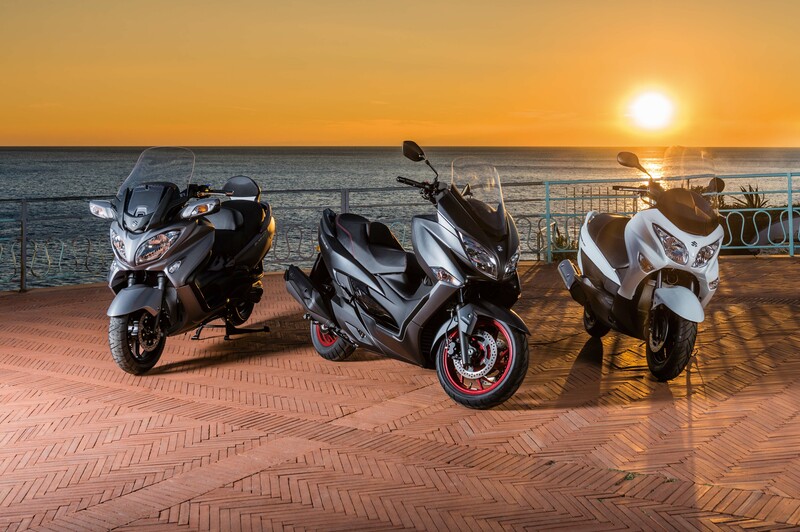 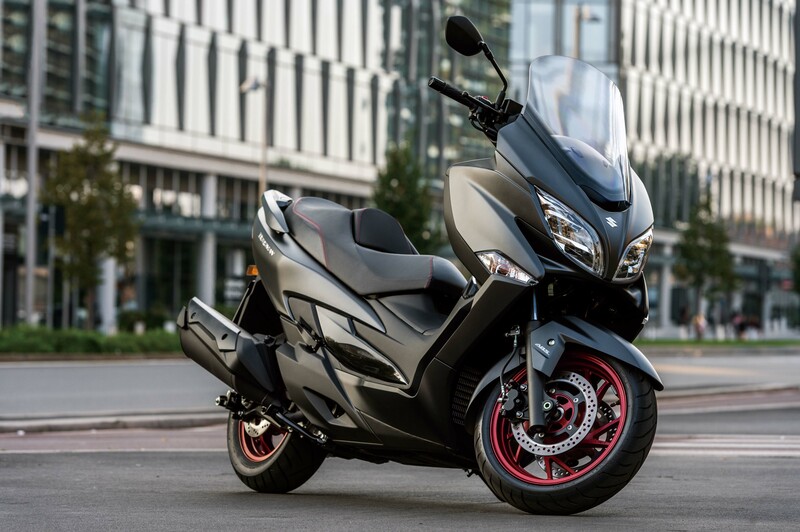 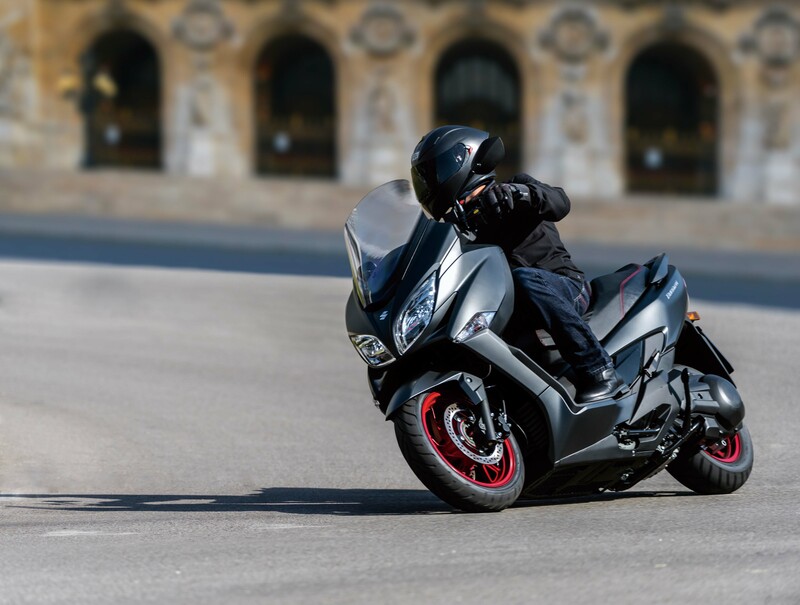 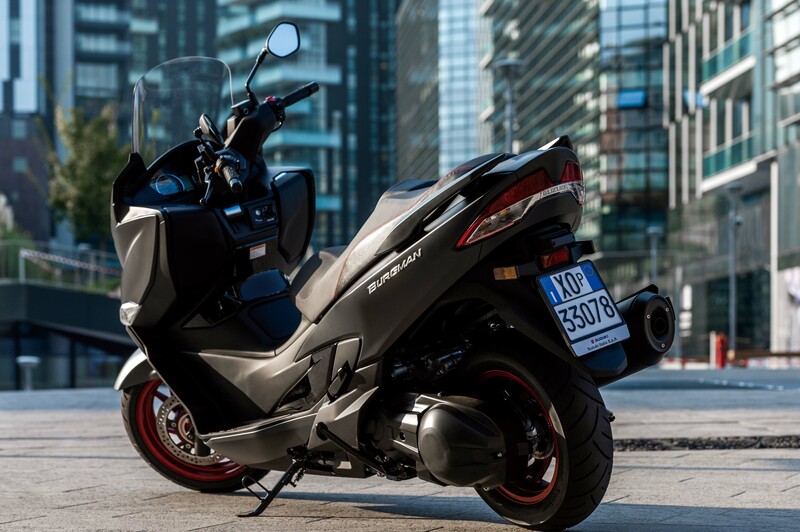 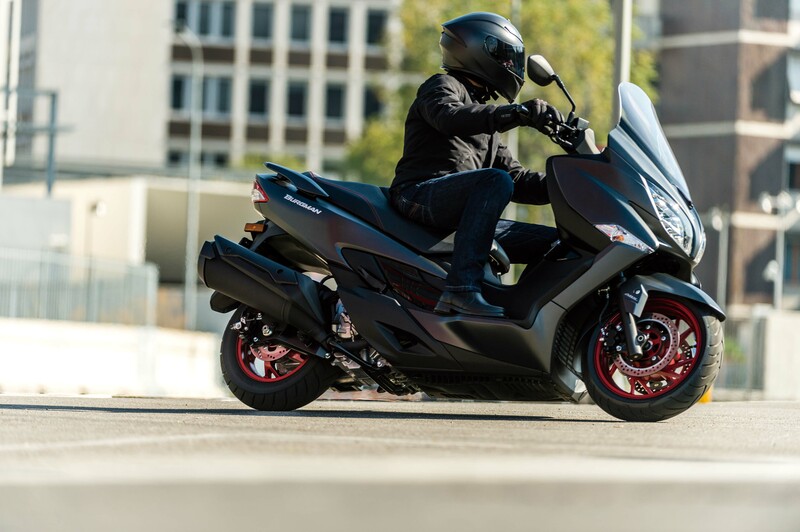 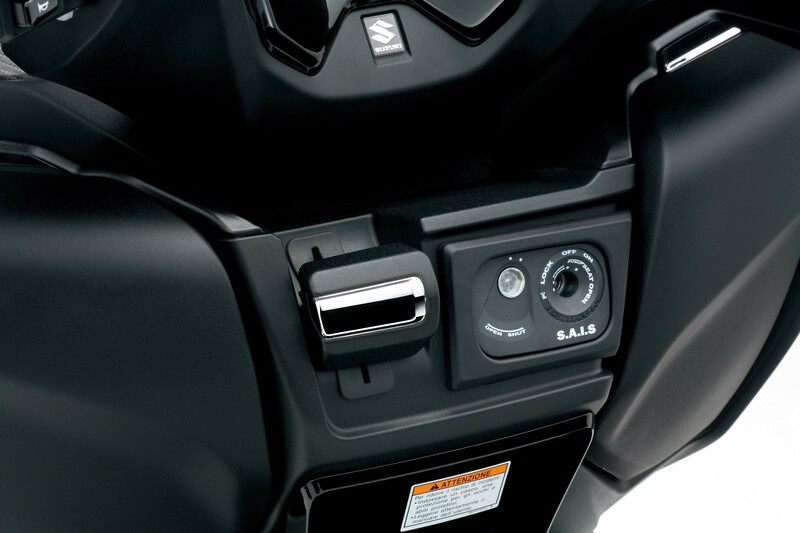 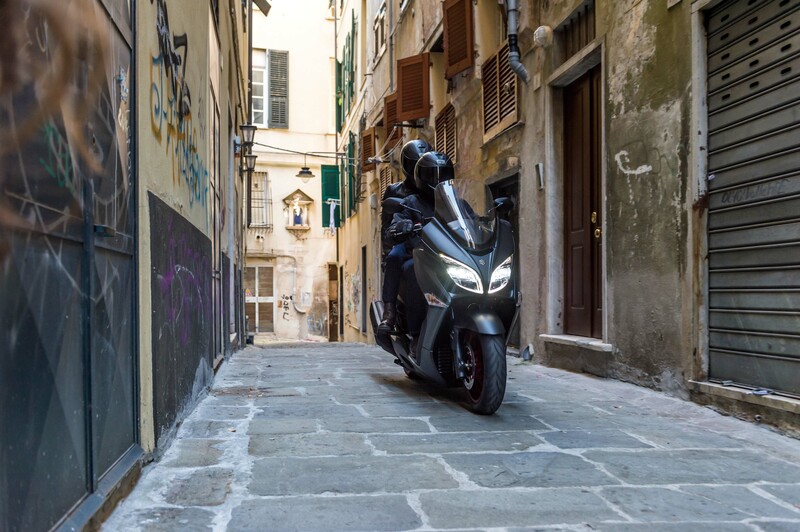 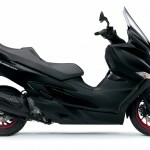 It’s not clear if the new Burgman 400 will be brought to the U.S., but if it is, Suzuki may have to add rear turn signal stalks as the integrated blinkers may be too close together for federal regulations. 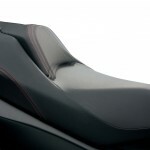 The stepped dual seat has a sleeker shape while offering thicker padding than the previous seat. 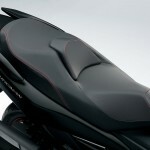 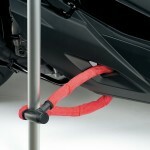 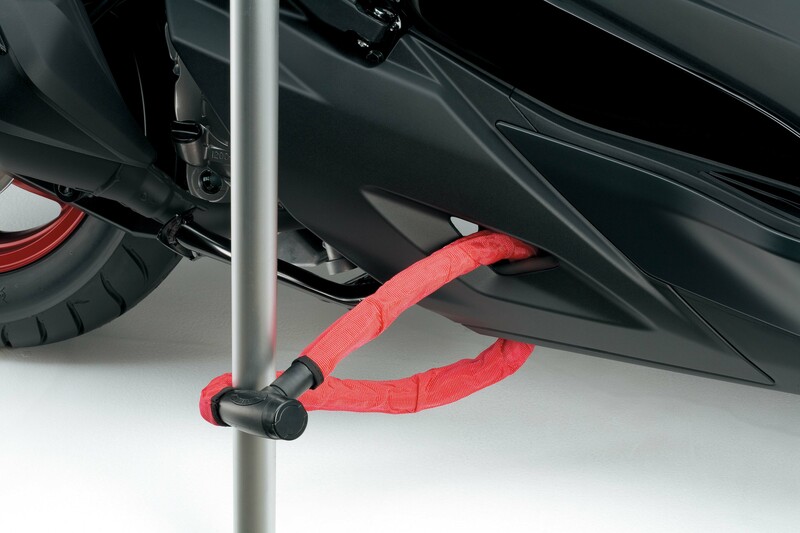 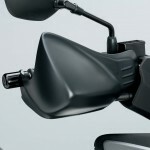 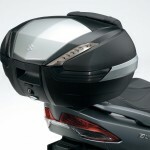 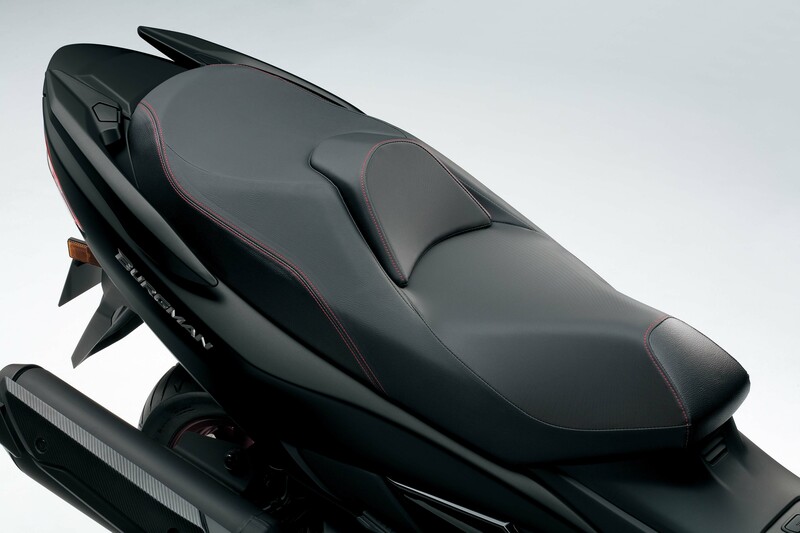 The rider backrest is adjustable, sliding forward by 0.6 or 1.2 inches to provide support for riders of different sizes. 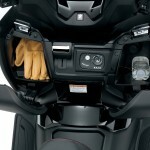 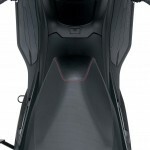 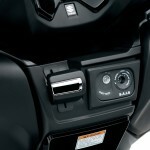 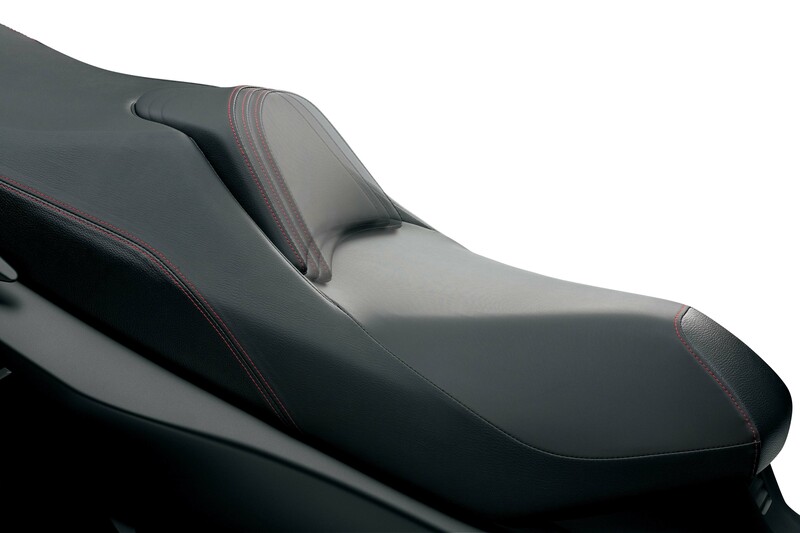 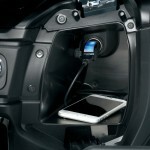 The new seat should improve rider comfort though it does increase the seat height by 1.6 inches to 29.5 inches. 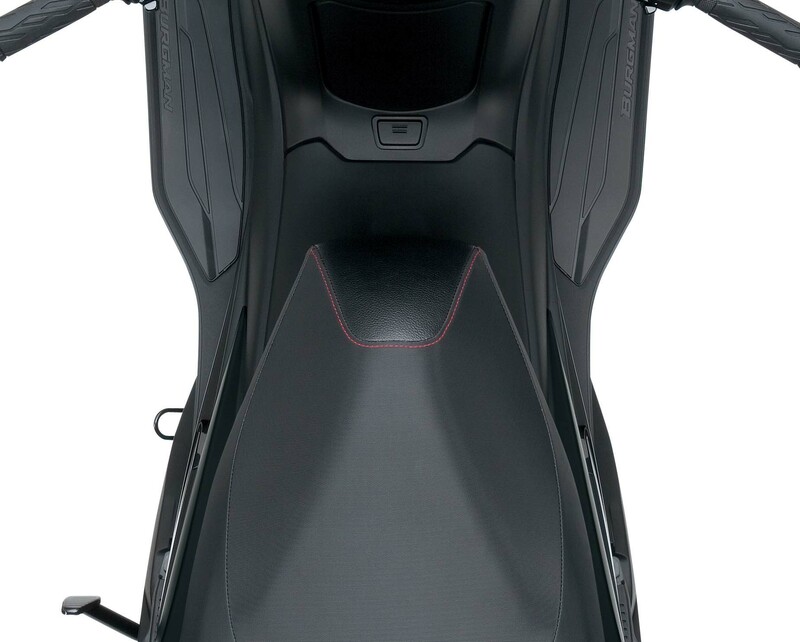 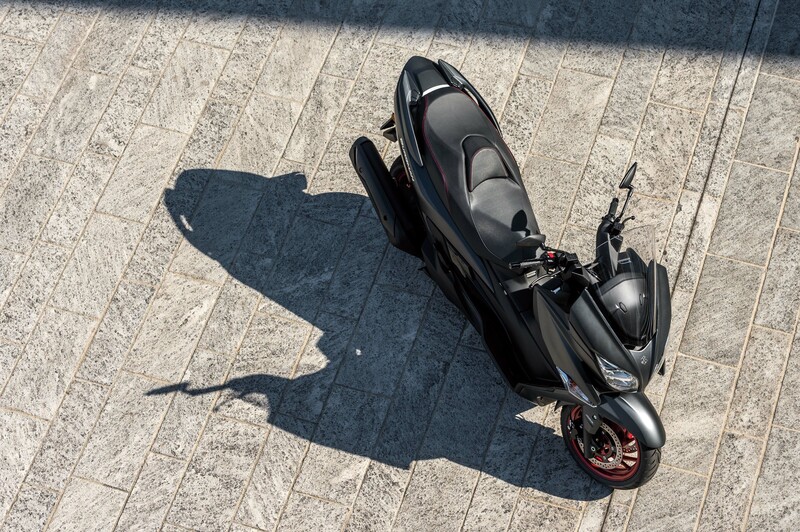 To compensate, the floorboards are narrower to make it easier for feet to meet the ground, and positioned further back for a more upright riding posture. 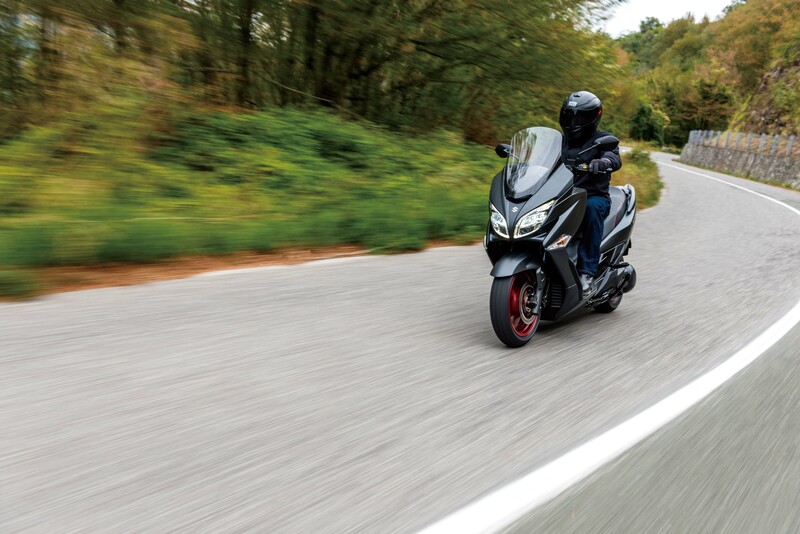 A 15-inch front wheel replaces the previous Burgman’s 14-inch rim, offering a sportier stance with improved stability. 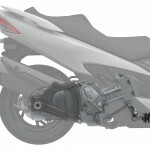 The front wheel is suspended by a 41mm fork offering 4.3 inches of travel. 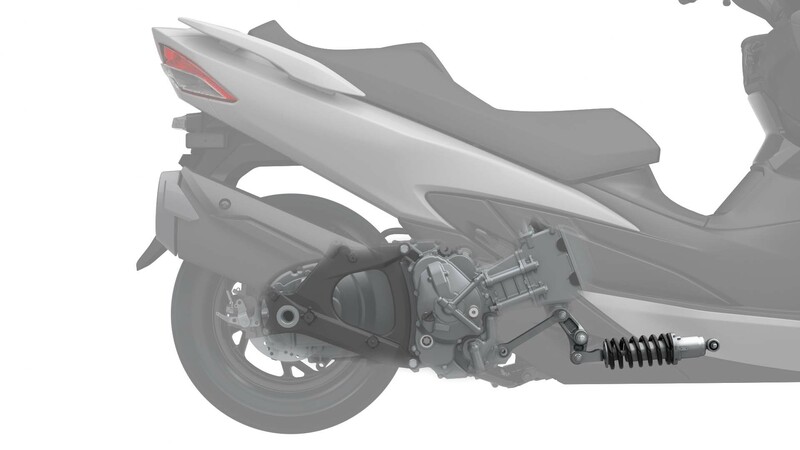 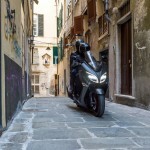 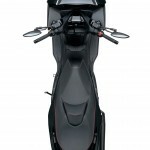 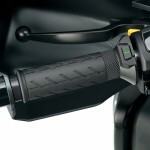 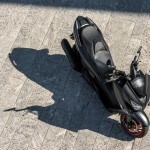 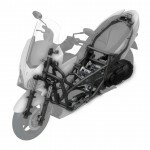 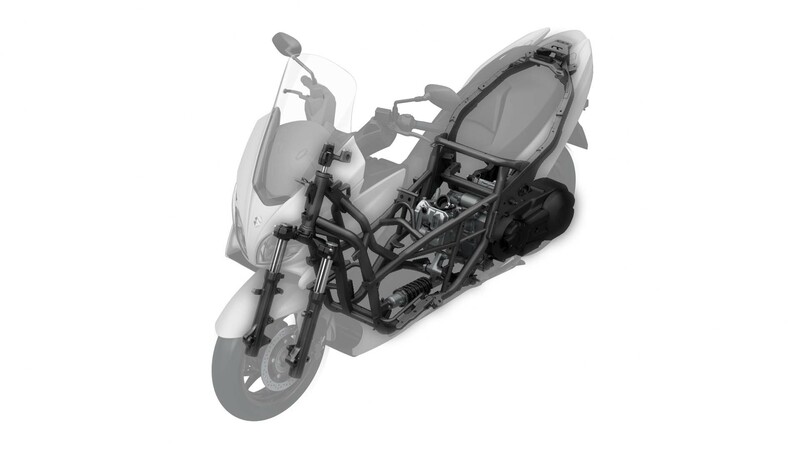 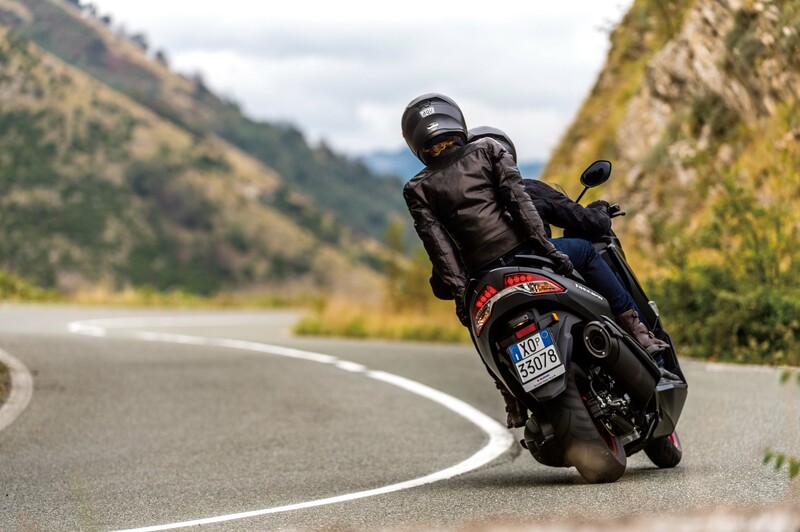 The rear wheel maintains the previous model’s 13-inch diameter and the swingarm is suspended by a link-type monoshock with seven-way adjustable spring preload. 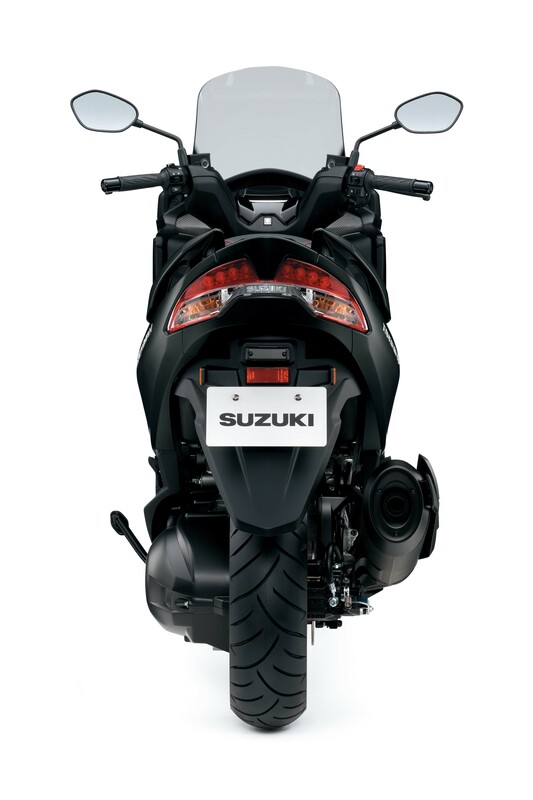 Braking is provided by dual 260mm front discs and a 210mm disc at the rear. 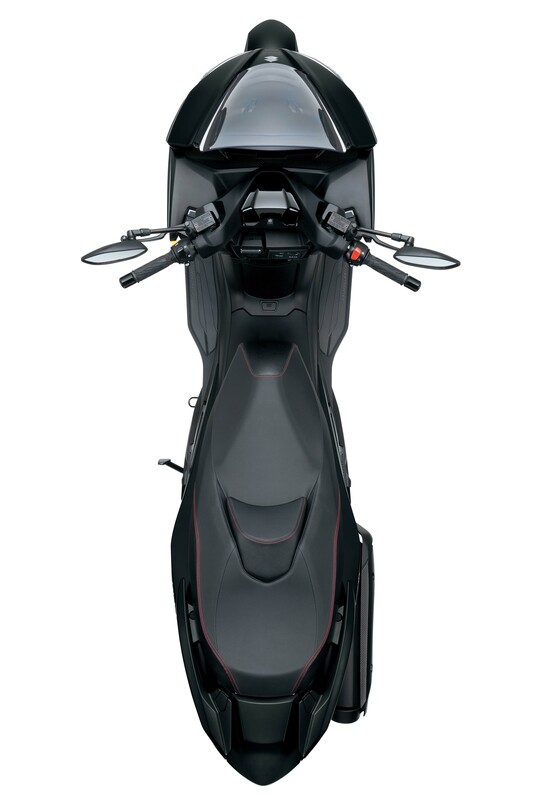 ABS is standard. 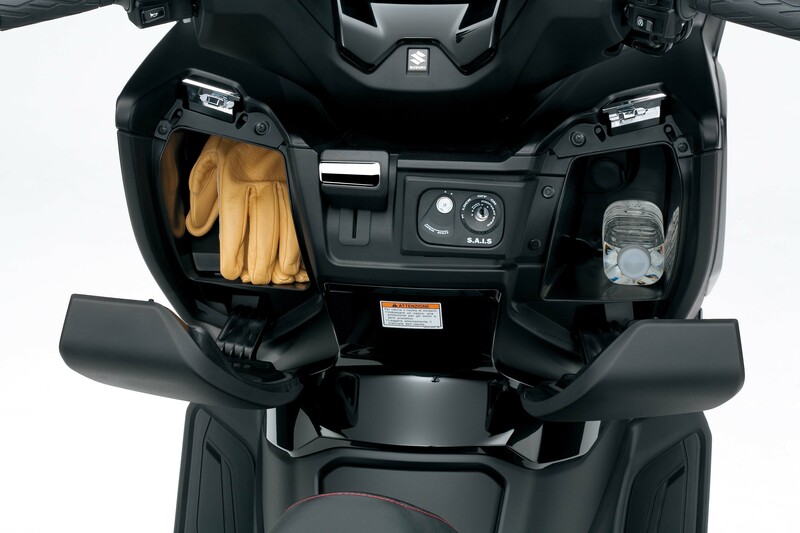 Other highlights include an updated multi-function display, 11.1 gallons of underseat storage, two front storage compartments, a 12V DC outlet and a new upswept windshield design.